Community is more than just part of Mission Community Market’s name. And right now, the organization is making sure that the community is heard. A new survey project, funded by the San Francisco Foundation’s Great Communities Collaborative and organized by MCM in partnership with MEDA seeks to include the perspective of Mission residents in programming for the future Mercado Plaza, to be built on Bartlett Street between 21st and 22nd Streets. With the plaza, MCM hopes to transform the space into a flexible, family-friendly area with overhead protection and permanent lighting fixtures that will help to brighten the street and make it safer. Located at what is, in many ways, the crossroads of the Mission District, MCM’s survey can serve another purpose too––engaging a historic Latin@ population that traditionally doesn’t participate in City-led community workshops. The survey project is focusing on getting feedback for future programming options at the Mercado Plaza, currently slated to be completed in the Spring of 2015. And the survey is intended for “those who live, work or go to school starting in (1) a 2-3 block radius around the future Mercado Plaza site and (2) historical Mission residents who usually don’t participate in other community feedback opportunities,” said Rosi Bustamante, executive director of MCM. Focusing on both of these populations is important — on one side the Plaza site is an affordable housing project and parking garage, and on the other a future mixed-use, condominium project. Seeking feedback from diverse sides will ensure Plaza programming will meet the needs of the community. 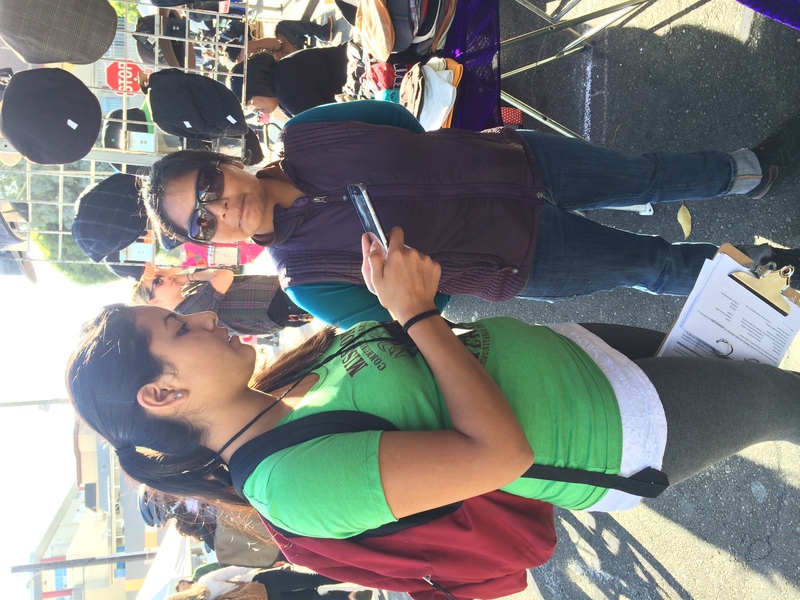 The local youth that MCM has hired to implement the surveys might hold the key to engaging all parts of the Mission District and ensuring that the Mercado Plaza is a space that benefits all. “We wanted to provide job and training opportunities to local youth, which is why we hired our surveyors,“ said Bustamante. Six bilingual, youth surveyors were hired, and MCM hopes that with the addition of these surveyors, they can include the voices of those in the community that are hardest to reach. From left to right: Daniel Cortes, Giovanni Carreño, Daniel Mendoza, Ivan Castro. Not pictured: Nathaly De Leon, Susy Rojas. 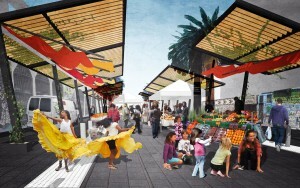 The anticipated design for The Mercado Plaza, opening March 2015. Last week, the survey team joined the market for the first time. “Two of us are here,” said Carreño, “and three more are going to houses in a two-block radius of the market.” The team will continue the survey process for about three more weeks, and hopes to administer at least 200 surveys in that time. “We needed to define a number that was attainable within our time and number of youth,” Bustamante said. And the team is hopeful. “I’d like to reach––or even exceed––the quota,” Carreño said. 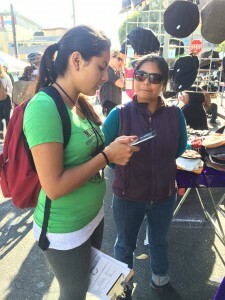 And for Carreño, the surveys are a chance to get in touch with the Mission District. “I want to know what people think,” he said. “I like learning about people.” When I asked him more about his surveying technique, Carreño admitted that he didn’t like to stick to the questions. “I try to just get an opinion,” he said. “I let them talk. You learn so much from people. Today [while surveying] I met a Peruvian lady at the laundromat, and she taught me about Machu Picchu. It takes a 5 hour train ride and 1 hour bus ride to get there!” said Carreño. The survey project offers a unique opportunity for MCM to connect with all residents of the Mission––and for those residents to influence the future of the district. And with their ability to connect with Mission residents from all walks of life, perhaps the youth surveyors, working in the heart of the Mission, are truly at the heart of it all. Happy Boy Farms returned to Mission Community Market two weeks ago, bringing their bags of lettuce, buckets of tomatoes, and fresh stance on organic produce with them. The farm is remarkable because of its variety––in the summertime, Happy Boy sells from over 200 acres worth of production. These acres vary in climate and geography; because the farm grows on multiple fields in multiple counties, some of Happy Boy’s fields are hot and dry, while others get coastal breezes even in the summertime. The result is a a varied landscape for produce. Staff at Happy Boy’s MCM stall. Working for the farm means variation, too. Iva, a driver with Happy Boy, tells me that drivers “play with a lot of different skill-sets,” including interacting with customers, handling produce, navigating markets, and driving long distances. Happy Boy’s drivers start their journeys from the farms packing sheds, where Happy Boy houses seedlings. Before the drivers even arrive at a market, they start out by checking in on the farm’s teeny plants. That initial interaction fosters an intimate relationship between the drivers and Happy Boy’s crops, beneficial for shoppers browsing at Happy Boy’s stalls. At their MCM stall, the mounds of tomatoes crowding their front tables are framed by the bunches of herbs and barrels of greens behind them. The stall hosts zucchinis, summer squashes, and bagged salad. A few customers in line are clutching finger-fulls of carrots, and some other are cradling bags of Happy Boy’s heirloom tomatoes. In addition to the vegetables, basil and fennel leaves are fanned out on Happy Boy’s tables. While most are likely familiar with basil, fennel’s bulbous white bottom and sprawling top is alien to many shoppers. 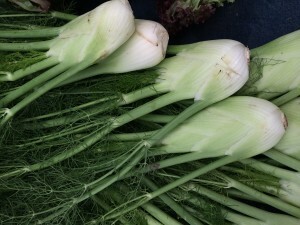 Fennel has a taste similar to licorice and anise, though it is described as sweeter. “I’m a really big fennel fan,” Iva tells me. “I feel like every year I work farmer’s markets people get more and more excited about fennel.” Iva suggests getting the most out of fennel by using the stems in pesto. Other recipe suggestions include caramelizing fennel in a salad, baking it with fish, or incorporating the seeds into biscuits. 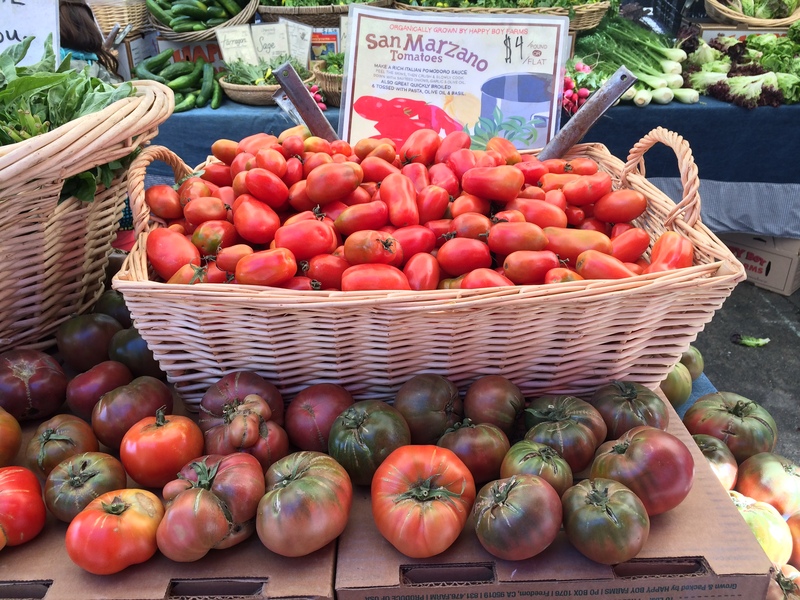 During the summertime, Happy Boy has San Marzano, Earl Girl, cherry, and heirloom tomatoes. Iva’s favorites are the purple heirlooms, which she suggests slicing and placing on top of a cooked dish, dicing for salsa, or eating them on their own for a snack. Earlygirl tomatoes are often prepared with mozzarella and basil, and San Marzanos make excellent sauces. After customers have come and picked through Happy Boy’s stalls, the farm donates all of its leftover produce. “Personally, one of my favorite things is knowing that everything we have is going to be eaten and enjoyed,” Iva says. I usually say I don’t like nice things––too much pressure, too fancy, makes me feel like a jerk, etc. But when the nice thing is something that you make for yourself and costs about six dollars, it’s worth it, right? As my first spoonful of this chutney made its way towards my mouth, I felt a little bit nervous. I wasn’t sure about how much ginger I had added, I hadn’t made chutney before, and I felt a lot of pressure for this to be really good––when would I have three 1/2 more figs again to use at my leisure? But the first taste was surprising––electric. This chutney is better than good: I want it spread on every slice of bread I have in my house, on the side of every vegetable I eat this week, and over vanilla ice cream for desert. This chutney only uses six main ingredients, most of which you will likely already have in your pantry. And it is surprisingly easy to make; I finished the process during the–heartbreaking–United States vs. Portugal soccer game last Sunday. Oh––did I mention that this would make a great dip for a World Cup viewing party? Put it on wheat crackers, toasted slices of baguette with basil, or strips of corn tortilla. 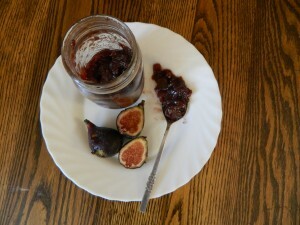 Chutney differs from jam (even savory jam!) because it is made with larger chunks of fruit and is simmered for a shorter length of time, leading to less water evaporating and fruit congealing. 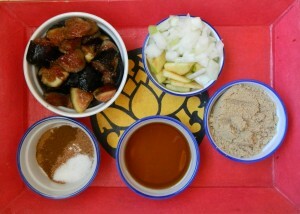 To determine whether your chutney is done simmering, draw a line through it with a wooden spoon. If the chutney fills the line back in immediately, it isn’t done. If the line holds, and you can see the bottom of the pot, your chutney is ready to eat. This Thursday, Arata Farms will be bringing their last batch of Black Mission Figs! Get a basket before they go, and then try this chutney out. Let me know how it goes by tweeting @missionmercado, or leaving a comment below. 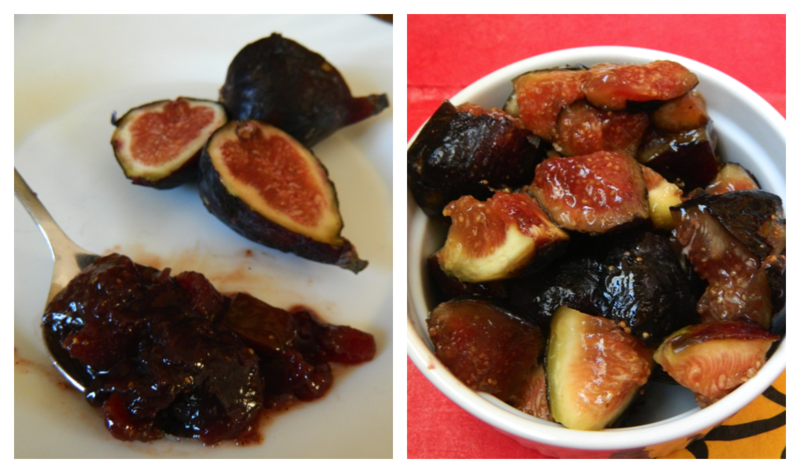 I already can’t wait for Arata’s White Kadota Fig season––I’m picturing a sweet chutney with white wine and raisins. Recipe adapted from Not Enough Cinnamon. The full recipe appears after the jump. It’s 9pm on a weeknight. Perhaps you just got off work––or you’ve finished dinner with a friend, had a few drinks. As you walk along Valencia, the skies are clear and the air is slightly chilly––you can feel the tingle on your arms and ears. Around you, the street is glowing with the lights of open businesses, and sounds of live music waft through the street. On both sides of Valencia, you can see events––people crowding bars and coffee shops to see the “next big thing,” or an accomplished jazz musician, or a young cellist. The crowds spill out onto the sidewalk, laughing and talking about what they thought of the music. Sound familiar? Probably not––yet. But ULUV Music is determined to change that. The organization’s goal is to increase local music industry in San Francisco by cultivating local artists and creating venues. 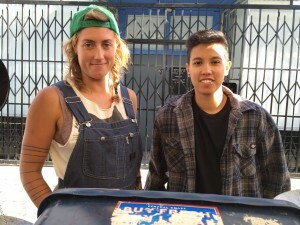 To get started, ULUV is focusing its community outreach on Valencia Street. “This [the Mission] is ground zero,” says Hector Corral, a team member at ULUV. To start conversations about their work in the Mission, ULUV has a booth at Mission Community market, where I am able to speak to Corral and Liz Irby, ULUV’s director of operations. As I approach the table, Irby is giving out stickers to a crowd of kids. And reestablishing the Bay Area’s music scene means that many nights would look like the scene described above, which ULUV calls a “music corridor.” Their goal is to increase foot traffic and provide venue options to passers-by ever night of the week, thus reasserting SF’s place in the music industry and cultivating music communities on the streets of San Francisco. To do so, ULUV is initiating district programs and hosting events. Though speak to me about both, it seems that the district initiatives are at the heart of their efforts. And they’re starting in the Mission. “The Mission is a good representation of what we want San Francisco to be,” Corral says. Irby agrees: “it’s an incredibly vibrant part of San Francisco.” She notes that though there are some music venues throughout the district, it isn’t considered a music hotspot. 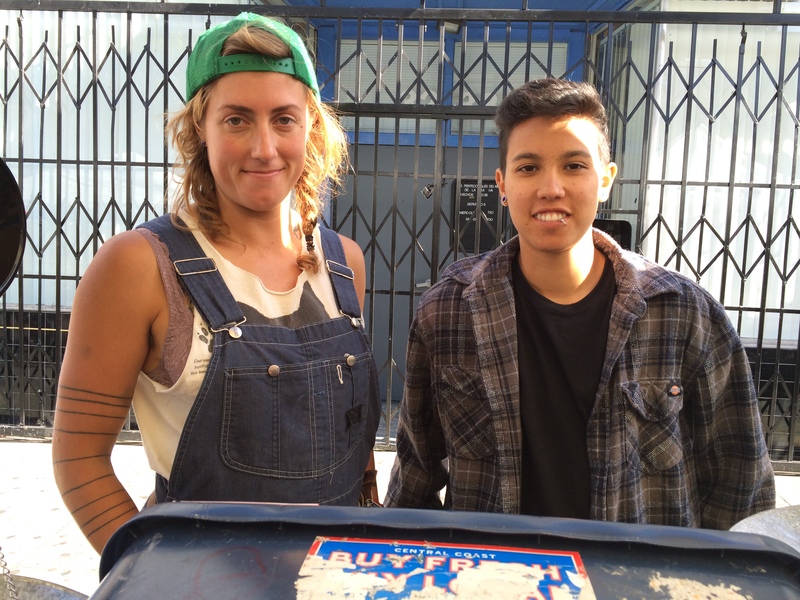 “We want people to think of the Mission as a place for live music,” she says. To create the “music corridor,” ULUV is encouraging small businesses to get Limited Live Performance permits. The permits cost $405 and allows any venue to host music from 5pm to 10pm. Currently, ULUV is targeting coffee shops, bars, and bookstores––more permits, ULUV believes, means more vendors. 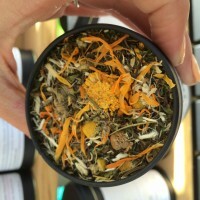 Along with the targeted vendors, ULUV currently has a list of 350 partner artists, all of which they will work to get playing in the new vendors when they are available. The musicians are all from the Bay Area, though San Francisco artists are the first priority. “The local artists are what really gives a city a lot of its flavor,” Irby says. ULUV is picky about which artists it supports. After a band shows interest in the organization, they attend a few live shows before they begin a relationship. Even if ULUV is interested in a band’s sound, they meet with all the members first. Working relationships are important to ULUV––to invest their time in a musician, they have to be sure that there won’t be problems in the future. “These are all good musicians that sound good,” Irby says. In the coming months, ULUV hopes to get 10-20 vendors set up with LLP permits. Then, they’ll start promoting their music festival, planned for October in the Mission District. “And then we’ll take over the world,” Irby jokes. Before their October event, ULUV is hosting a “music day,” on June 21st. Venues scattered throughout San Francisco will be hosting musicians from 12pm-5pm. 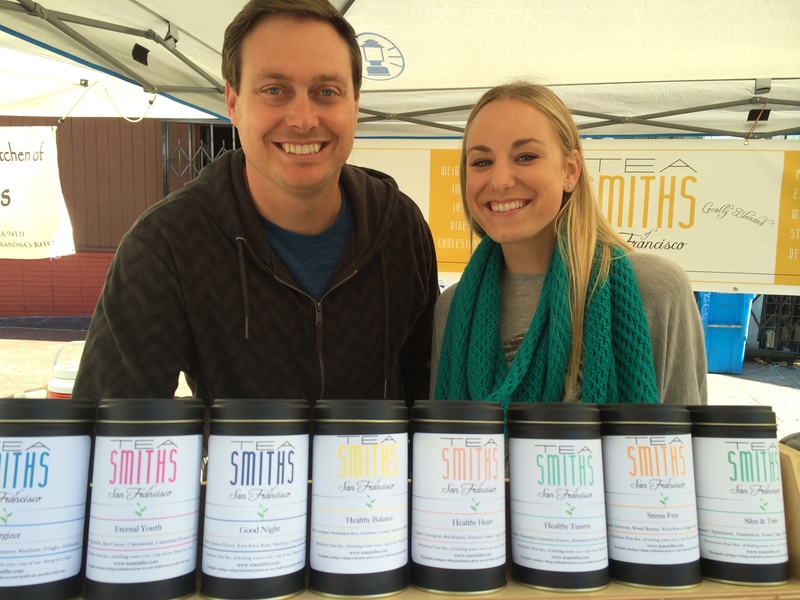 Local Mission venues are Blue Fig, Fourbarrel Coffee, and Chile Lindo. Then, at 6pm, bands will gather at Dolores Park, for an after party–including open mics and beer–at Dolores Park Cafe. 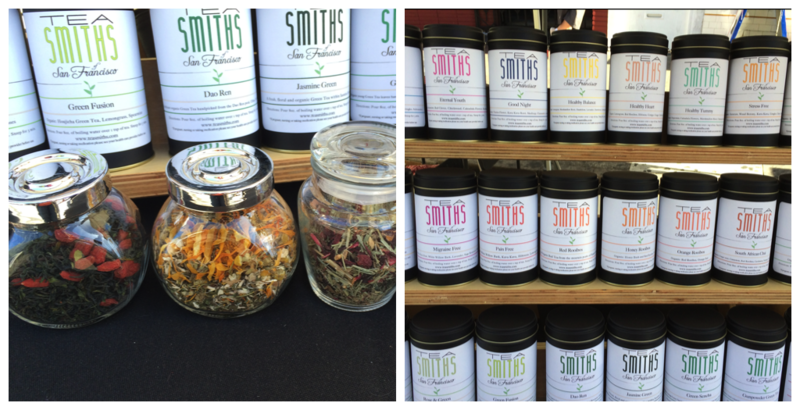 ULUV Music will be at Mission Community Market this Thursday, 6/12 and next, 6/19. Stop by their booth to ask questions, and follow them on instagram.